This past Sunday took us down into an old heart of Tokyo, near Yanaka and its magnificent gardens to visit a new farmer's market. It's an area where we often take guests because it feels old (it is) that results in a certain charm that can't be found anywhere else. Old wooden houses dot narrow lanes near some of the loveliest temples and shrines I've visited yet (including those in Kyoto, Nara, and Nikko.) So, despite chilly weather that threatened rain we sallied forth with umbrellas and waterproof shopping bags to see what we could find. The Nippori Farmer's Market is what I would call “off-the-grid.” It's not part of the larger Marche Japon gig or the all-organic Earth Day Markets series, but rather is the brainchild of the owner of a nearby mansion (condominium) owner who wanted to “do something nice” with the plaza space in front of the high rises. Given Nippori's historic feel and past controversies regarding the Fuji Viewing Street, it makes sense that he'd want to try to balance out his very modern high rises. Based on my first visit I'd say this effort is a successful one. The Nippori Farmer's Market is small – about 30 to 40 vendors – but very pleasant with a remarkably good selection of items. Fresh vegetables, rice, cheese, seedlings, baked goods, fruit, and prepared foods to be eaten on the spot as well as those for snacking were all on hand. 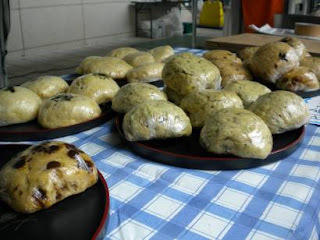 (I recommend without reservation Tatsuko Onaya's homemade manju and Ringo no Hana's steaming bowls of hearty tonjirou. We sat down for much-needed breaks at their respective tents to enjoy our food and take in the atmosphere of the market.) Vendors from Hokkaido, Niigata, Gunma, Aomori, and Aizu Wakamatu sported everything from potatoes to fish to apple vinegar to cabbage to nanohana to dried natto and bath salts. Certainly, the personal tour given me by Atsuko, the market manager, set the stage for a great visit, but in the end as always, it is the vendors that make the experience. To a person they were warm and welcoming, nearly all had samples and were ready to talk about their wares more in-depth. The atmosphere they created reminded me why small markets are sometimes preferable to large ones. The opportunity to talk with vendors is better since I don't feel like I'm taking up too much time or space, and there's more opportunity to peruse the market itself. The overall selection might be smaller – only one person selling strawberries, for example – but I don't really mind. It is sometimes nice to have only a few good things to choose from rather than having to search out the best of ten. Started a little less than two years ago, the Nippori Farmer's Market has a homespun quality that is a delight to find in a big city. Vendor's chatted with each other as well as customer's, and even danced a bit at their stalls when the musical performances started. 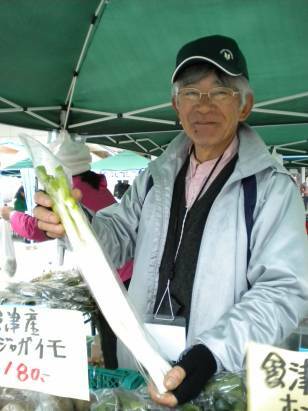 The presence of growers and producers from Aizu Wakamatsu, Miyagi, and Ibaraki mean, too, it's a good chance to support Tohoku as the region continues to rebuild and reimagine itself. Held monthly on both Saturday and Sunday visitors are sure to find plenty of good things to eat and explore. I know I'll be back. 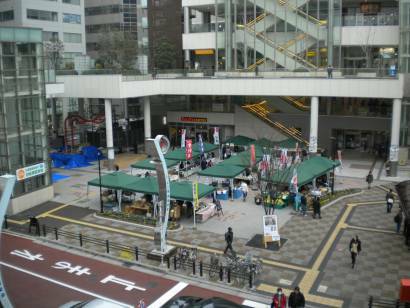 Directions: Head out the East exit of the Nippori Station and look for the cluster of green awnings in the plaza. Or listen for the sound of taiko drums!